"The combination of salty bacon with rich chocolate sounds strange but is surprisingly delicious." Fry bacon in a skillet over medium-high heat until nearly crisp, about 5 minutes. Add honey and stir until the foaming subsides. Remove the bacon with a slotted spoon to a plate to cool. Sift flour, cocoa powder, and salt together in a bowl; add to the egg mixture. Fold bacon and chocolate chips into the mixture; pour into the prepared baking dish. Bake in the preheated oven until a toothpick inserted into the center comes out clean, 25 to 35 minutes. Allow brownies to cool for 20 minutes before cutting into squares. If you freeze the bacon first, it's easier to dice. A nice touch is to place the candied bacon on top of the brownies. If you choose to do this, cook the bacon a little less initially, because it will continue to cook in the oven on top of the batter. 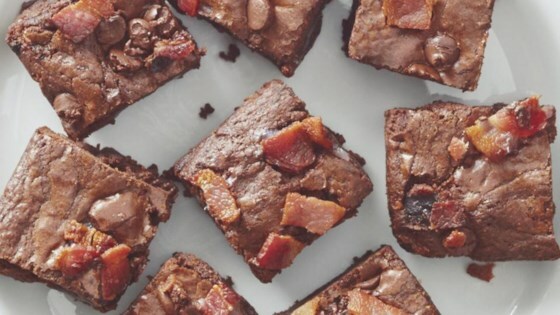 Great brownie recipe, and the bacon works with the chocolate surprisingly well! It was very, very good! The sweet/salty combination works! Definately a winner. They were a perfect sweet treat for Father's Day!